If you have read Lars Mytting’s non-fiction bestseller ‘Norwegian Wood’, then you will know that the Scandinavian’s believe you can tell a lot about a person from their log store, and women looking for a potential husband would always investigate how he stacked his wood! It is a country obsessed by all aspects of firewood, many weddings and funerals have seen heated arguments about the best make of axe, or whether wood should be stacked bark up or bark down. 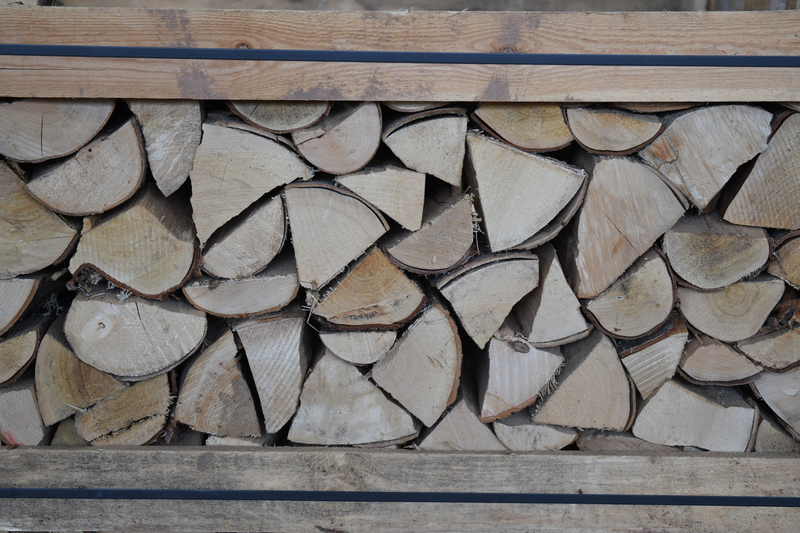 Whilst we don’t want to take things quite that far, we do have some really good advice on how to store your wood to ensure that you get the maximum amount of heat and convenience throughout the Scottish winter. All of the firewood that we supply is of course ready split for you. As well as halving your work load, splitting also speeds up the drying process due to an increased surface area being exposed to the air. Also, you know that you are getting the best quality wood, split in the right way. When storing your firewood, it is important that it is located in a convenient position for you. Firewood can be heavy to carry from your store into your home, especially during the cold winter months. Find an appropriate place as close to your home as possible. You must make sure that your log store is well ventilated, the wind is a wonderful natural element that can help to dry your logs out and keep them dry. Of course, you should ensure that your store is in the best position to avoid driving rain and snow from getting your logs wet. Keeping logs dry is more than just about protecting them from the elements above, you also need to keep them dry from the bottom. A really cheap and easy way to achieve this is with wooden pallets, ensuring that the logs are kept off the ground and also have plenty of ventilation from underneath. Stacking can take a bit of practice to get right, but it’s an important part of the process. Ideally, your log stacks should be about a metre tall and not be more than one log-length in depth. The logs need to be stacked in such a way that there is plenty of air circulation. Leave gaps between the logs and make sure none are left covered. This will ensure that the logs will have the best possible ventilation they can and ensure that they burn well and create the most possible heat. If you are going to stack your logs next to a wall or shed, make sure you leave plenty of space, as this will allow for air circulation. Stacking your logs up against a wall can often result in wet logs and termites, as well as other unwanted creatures! Leave a gap of between 5 to 10cm between the logs and the wall, to achieve the best ventilation around your logs. One of the biggest mistakes that people make is covering your logs completely with something like a tarpaulin sheet. This will seal the entire pile and stop air circulation, allowing moisture to gather and damage your supply. You need to make sure that that the sides remain uncovered for proper aeration. If possible, build a wood shelter that can sit over the top of the logs. We hope that our tips for burning wood the Scottish way are indeed helpful to you and that it helps you to stay warm this winter.